Super Stress cards are the right choice for non-printed applications like embossing and imprinting, but also can be appropriate choices for printed applications. The lettering on these cards is highly visible when embossed and is ideal for applications where easy readability is desired, such as hospital and government environments. 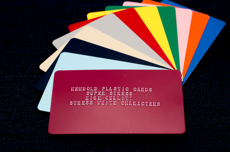 Super Stress cards are laminated with a stress overlay over the plastic core material that causes the embossed lettering to be highly visible to the human eye.